In 1765 the Real Audiencia of Bogotá, the highest court in the Viceroyalty of Nueva Granada (present-day Colombia, Venezuela, Ecuador and Panamá), expelled José de Burgos from the city for six years. He was accused of being a leguleyo, pretending to be a lawyer, swindling peasants and merchants, and disrupting the public peace. Three years later, while José was serving his sentence in Cartagena –on the coast of Colombia in the Caribbean-, the General Attorney of the city (Procurador General Joseph García) demanded that Burgos be expelled from that city and banned from interfering in courts and any legal proceeding. In the late colonial Viceroyalty of Nueva Granada authorities and legal practitioners launched multiple accusations to discredit other legal practitioners deemed leguleyos (under-qualified, unscrupulous lawyers) and picapleitos (instigators). They were disqualified from judicial practice, and accused of misconduct, instigating disputes, threatening public order, overstepping their authority, and extortion. Compared to the late colonial period, these accusations increased substantially in the early republic. Disqualifications and accusations of misconduct were thus a reaction from legal practitioners and authorities as to how they perceived their sphere of action and their market of legal services threatened by the state efforts to reform justice administration and the legal profession in the early republic. In the words of Joseph García –the attorney who accused Burgos in Cartagena in 1768, keeping cities and courts free of leguleyos must be the primary concern of “good judges” in “well organized republics.” Indeed, these accusations and posterior reforms entailed the disqualification of non-specialists, the constitution of the court as a separated and bounded space, and the formation of a legal bureaucracy. However, since these accusations shaped the dividing line between professionals and non-professionals mostly in terms honorability and social and political capital. I will argue that they were predominantly instances reshaping internal dynamics of power and reproducing colonial judicial practices and legal cultures. In so doing, under-qualified legal practitioners and accusations of misconduct were both: a product of the colonial and early republican state policies on justice administration and the legal profession; and a phenomena that finally challenged the liberal projects of judicial reform launched in the region during the 19th century. 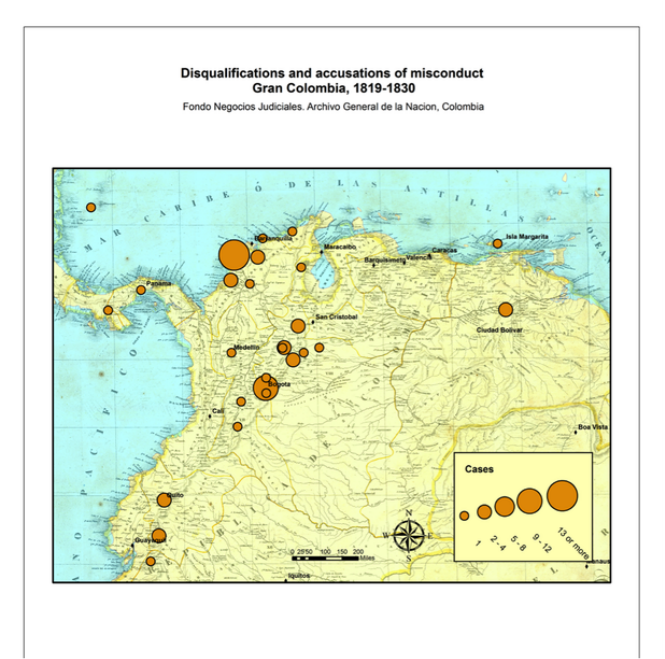 This research examines three historical processes related to the projects of legal professionalization and state formation in Nueva Granada during the late colonial period and the early republic. One, the increase in the number of legal practitioners and authorities accusing other legal practitioners of misconduct. Two, within these accusations, the creation of a dividing line between the practices of those considered to be professionals and non-professionals. Lastly, how this process of reform could explain why the judicial system became dysfunctional and unwilling to reform in post-colonial Nueva Granada. Archivo General de la Nación (AGN), Colombia. Colonia, Policía, Legajo 6, Folio 501-676 and Colonia, Médicos y Abogados, Legajo 2, Folio 392-541. Extracted from "Pettifoggers Contesting the State: Legal profession and Judicial Misconduct in Late Colonial Nueva Granada," 13th Annual Harvard Graduate Student Conference: Law & International History. Harvard University, Cambridge, Massachusetts, March 14 and 15, 2013. Understanding the Spatial Dimension of Accusations and Legal Professionalization. The Early Republic in Nueva Granada. As highlighted by Tamar Herzog and Charles Cutter, while professional legal officials seemed far removed from courts and mostly concentrated in political administrative centers, legal practitioners without formal education shaped legal culture and judicial practices in local arenas in colonial Latin America. In Nueva Granada between 1770 and 1790, colonial authorities launched new restrictions on the formation and accreditation of lawyers as a strategy to reduce the power of Jesuits and Dominicans, who had held the monopoly of legal education during the whole colonial period. After 1795, when several law students participated in the conspiracy led by Antonio Nariño against colonial authorities, restrictions against the formation of lawyers gained a new concrete political reason. Likewise, since lawyers with formal education preferred judicial positions on the Real Audiencia or other higher positions, the reduction in the amount of lawyers also helped to relieve pressures for administrative and political positions. During the independence process, however, these policies against lawyers became stronger. According to Uribe Urán, since they were deemed revolutionary agents, in Nueva Granada a quarter of lawyers were executed in the decade between 1810-1820. At the beginning of the post-colonial period, subsequently, the number of official legal practitioners was much less than in the colonial period, which might have challenged any real change in the judicial sphere during this transitional period in the region. The state policies on the legal profession and justice administration changed during the 1820s. After a period of wars and political instability in the region until 1819, Nueva Granada became “Gran Colombia” (1819-1830), which is considered the first and most important republican state project in the region. As Figure 1 shows, during this period, the state demonstrated a wider concern regarding the conditions of justice administration and launched a set of reforms trying to re-organize public offices, jurisdictions, legal proceedings, and infrastructure. During this period, the rise in the number of legal practitioners disqualified and accused of misconduct is much greater than the previous period. In the late colonial period -between 1765 and 1808- I have identified just 13 cases (Figure 2); between 1819 and 1830, I have identified 62 (Figure 3). 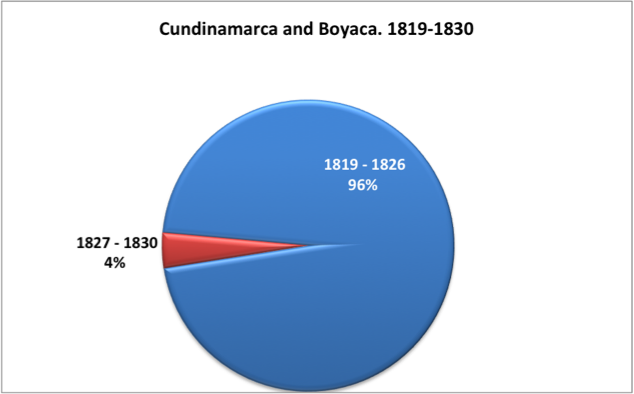 These later cases were concentrated between 1820 and 1826 in the Department of Cundinamarca and Boyacá (the central area of current Colombia). 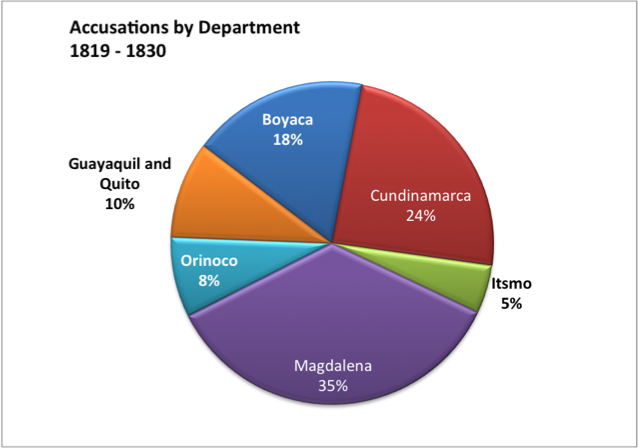 However, after 1826 they became heavily concentrated in the Department of Magdalena, on the Caribbean coast (Figure 4). Within this new system trying to secularize and decentralize the education of professional lawyers, law students could get a legal degree in a shorter amount of time; they could also take several classes simultaneously (something impossible before 1820); and received credits for classes taken in Colegios Provinciales (Provincial Secondary Schools) and other regional institutions. In fact, as Figure 5 shows the graduation rate for law students between 1820 and 1830 increased substantially compared to the previous period and meant the beginning of a sustained growth in the amount of certified lawyers in the region. During the 1820’s the Gran Colombian state launched an extensive set of reforms on justice administration and the legal profession. Although the success of those efforts is not clear in terms of the changes in judicial practices and legal knowledge. Legal practitioners would have felt their local power relationships and the sale of their services threatened by how the republican state placed legal education and judicial reform in the center of the state-building project. Disqualifications and accusations of misconduct in this period might be considered as part of state efforts trying to professionalize judicial practices. However, the analysis of the arguments disputed in this accusation shows that disqualifications in this period mostly followed the pattern of the colonial cases. The border between professionals and non-professionals was again shaped in terms of honor and social capital associated to local power relationships and their client networks. As Tamar Herzog has stressed, in the colonial period, neighborhood, local fidelities and extrajudicial interests basically ruled the performance of judicial institutions. 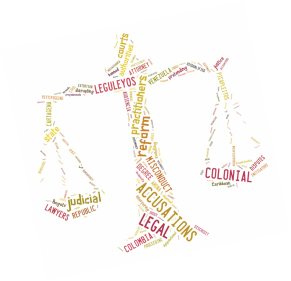 These patterns in the judicial mechanisms of conflict resolution seem to be integrally transferred to cases disqualifying legal practitioners even beyond the colonial period. Although the rise of accusations is associated to a general project of criticism and reform led by the republican state, the accusations were a reaction to those intents of reform and basically reinforced colonial judicial practices and conceptions about the functioning of law and justice. Historians have detected a different pattern in certain regions in the 1830s and 40s. Studies on Venezuela during this time, once it became fully independent, have stated that accusations of misconduct became more “legal” or “professional” while they stopped using arguments based on social or extralegal dynamics (e.g. honor). Stressing the earlier liberalism of Venezuelan courts and politics during the 19th century, these studies have pointed out that accusations of misconduct took on a far more “legislative” tone and became more morally neutral after 1830. To explain this, these studies have highlighted the geo-political location of Venezuela, being marginal from colonial centers and more exposed to transatlantic liberal ideas. Although the accusations analysed here seem relatively homogeneous in terms of the extra-legal arguments (at least until 1830), the comparison with the Venezuelan development in the 1830’s and 1840’s raises several questions about how this process followed different paths according to local and regional dynamics. What exactly made the tone of Venezuelan accusations more “law-based”? How could they have created a better context to implement judicial reforms during the second half of the 19th century? 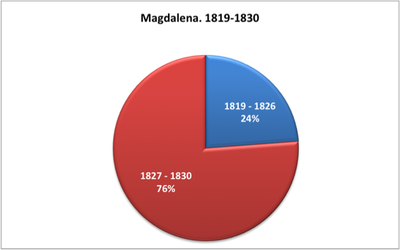 How can historians understand in comparative perspective what happened in Venezuela after the 1830’s with the case of Magdalena and the rest of post-colonial Nueva Granada in the previous period? 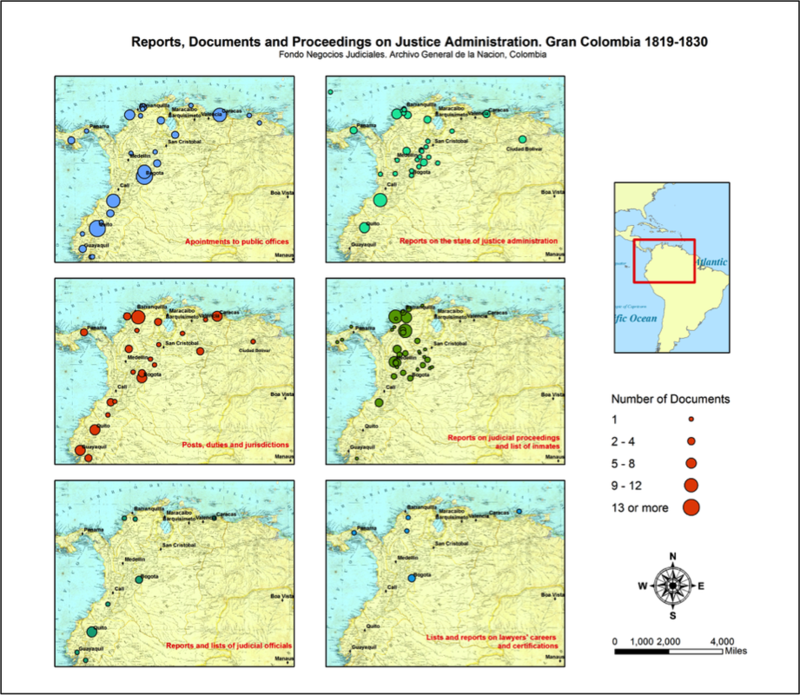 Historians must consider the spatial and temporal differences in the amount of those accusations, the ways that those arguments changed in the following period, and the spatial state’s role providing legal instruction and certification. They are crucial factors to understand the complex process by which post-colonial states tried to reform judicial systems and the legal profession, and how legal practitioners and authorities contested or assisted in those projects. The historical roots of the continuing process of judicial reform in Latin America can be found in charges of misconduct against those deemed as non-professional legal practitioners. This shows how the judicial arena shaped judicial corruption, political legitimacy, and governance during a formative period of nation state development in the region. Tamar Herzog, “Sobre la cultura jurídica en la América colonial (siglos XVI-XVIII),” Anuario de Historia del Derecho Español, 65, 1995, p. 903; Charles Cutter …. Victor Uribe Urán, “Educación legal y formación del Estado colombiano durante la transicion de la Colonia a la República, 1780-1850, ” in Javier Guerrero Barón (comp. ), Etnias, educación y archivos en la Historia Colombiana, Universidad Pedagógica y Tecnológica de Colombia, Tunja, 1997. Uribe Urán (2000), p. 249. Ibid., p. 250 and 254. Tamar Herzog (2004), and “La vecindad: Entre condición formal y negociación continua. Reflexiones en torno de las categorías sociales y las redes personales”, Anuario/IEHS 15, 2000. See: Reuben Zahler, “Liberal Justice: Judicial Reform in Venezuela’s Courts, 1786-1850,” Hispanic American Historical Review, 90, 3, 2010; and “Complaining Like a Liberal: Redefining Law, Justice, and Official Misconduct in Venezuela, 1790-1850,” The Americas 65, 3, 2009. 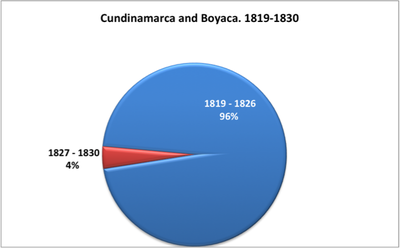 Data in Victor Uribe Urán, “Educación legal y formación del Estado colombiano durante la transicion de la Colonia a la República, 1780-1850, ” in Javier Guerrero Barón (comp. ), Etnias, educación y archivos en la Historia Colombiana, Universidad Pedagógica y Tecnológica de Colombia, Tunja, 1997. "Leguleyos Contesting the State: Misconduct, Legal Cultures and Judicial Reform in Late and Postcolonial Nueva Granada"
LASA2014, Chicago, Il, May 21-24, 2014. "Without Enough Knowledge or a Legal Degree: Leguleyos, Misconduct and Legal Professionalization in Late Colonial Nueva Granada"
"Pettifoggers Contesting the State: Legal profession and Judicial Misconduct in Late Colonial Nueva Granada"
13th Annual Harvard Graduate Student Conference: Law & International History. Harvard University, Cambridge, Massachusetts, March 14 and 15, 2013. Ibero-Amerikanisches Institut, Gebr. Mann Verlag, Berlin, 2011.
del triunfo de Hugo Chávez el 7 de octubre de 2012.